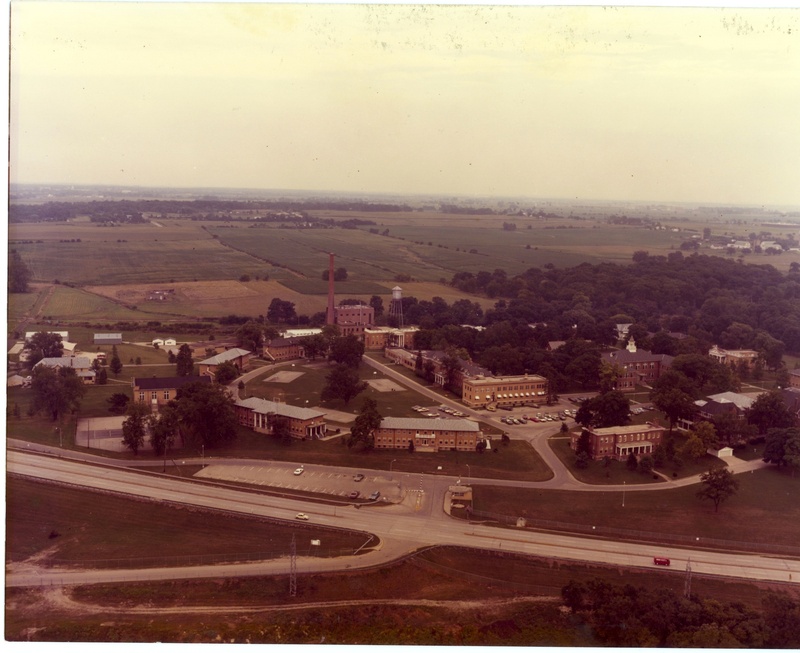 This is how I remember Illinois State Training School for Girls, Geneva, Illinois. I used to park my car in the lot just opposite the guard station then walk through the middle of the grounds to Geneva Cottage or to Oak and Wallace Cottage on the right (just out of the picture). The cemetery is in the wooded area to the right. Even though I know there are beautiful homes built on this site now, I can’t imagine anything other than the place as it was when I worked there and youngsters were attending school, working and living in these buildings. Does anyone know what all the buildings are? This is what I remember – correct me if I’m wrong. The little building at the entrance opposite the parking lot is the guard station. The building to the right of the driveway going to the second parking lot is the Administration Building (pathway to the door) with an employee residential building just to its right. Behind the second parking lot is the dispensary and the school to the right – the one with the steeple. Behind those buildings are the laundry, kitchen and other maintenance type buildings. Surrounding the middle are the cottages that became ‘home’ to the juveniles incarcerated there. Also a chapel is to the right of the school. I’m not exactly sure where but on the left was where inmates could go rollerskating and swimming. I remember a scary incident at the pool when an excited young girl saw the pool for the first time. She had never been in a swimming pool and couldn’t wait top get in and get wet. She jumped in, landed near me but couldn’t swim. Without any fear and laughing the whole while, she ‘climbed’ up me to stay above the water. I was pushed under and almost drowned! This photo is a real memory jogger for me. I’d forgotten how big the institution was and how many buildings there were. What stories does it bring back to you? My grandmother went here in 1962. My mom was born there in 1963. I don’t know very much about this place, or how to contact the doctor or any records. My mom was told that O’ Dwyer was actually just the case worker? He is on her b.certificate. Please, if anyone knows any information or has any advice please email me at angierock910810@gmail.com..Thank you..
I’m sorry your sister’s experience was so horrible. After reading other people’s accounts, I’m not surprised. The pain can fester for years. I hope she has been able to move past it and found peace. Some people have found writing their stories to be cathartic but I wouldn’t recommend without lots of support around. If you think it will help your sister to have a voice, I can post her story on the True Story pages – give her a page under that title. Let me know and I’ll tell you where to email it. You sound like a caring, loving sister. She’s lucky. Best wishes to both of you. My Great Grandmother was listed as being an inmate in the 1910 census – Mabel Catherine May. She was 12. She married my Great Grandfather at age 18 – I’m assuming when she was released as an adult. I’m looking for any information about the place. Shari, the Geneva Historical Society has a lot of pictures from the early 1900s. They aren’t on display and you’d probably have to arrange to view them. Don’t think there are names to identify anyone though. I don’t know where old records are kept. Years ago I tried to find out from Illinois Corrections and Illinois Archives but no one responded to my queries. I’ve heard there are records stored at St Charles Boys School (not sure of current name). Please let us know if you uncover anything. Thank you for posting. Hi. My name is Ellie and I understand that this was from a couple months ago, but I thought you would enjoy to know, I myself live in this neighborhood and I can tell you sometimes talk about this gets really supernatural. This is indeed the picture of our neighborhood, I can connect all of the roads, the offroads, forest preserve, fields and more. This picture matches our neighborhood perfectly. If you have visited the ‘baby graveyard’ we like to call it, you can still see most of the grave engravings clear, and Becky is in fact one of them after reading another article and visiting the the graveyard again. Not meaning to offend, I hope I informed you enough to believe what’s teue and what’s not and inform others as well. Have a nice day, and come and visit the graveyard sometime! Hi Ellie. I definately believe you! I was there in 2012 with one of the girls (now woman) that was incarcerated there in the 60s. It was a very emotional experience. I found the graveyard to be especially sad because it has been damaged by vandals and not maintained. I believe when the property was bought and developed, there was a condition that the cemetery be maintained. Out of respect to those buried, this should be honoured. You have probably seen the concrete ‘doorway’ to the right and to the back of the cemetery. There is a woods and trail the other side of it. Brenda told me this was called The Gate to Hell by the girls. Do you know if it is still called that by the locals? #8 | Written by Kyle Miller on September 29, 2016. Hi Cherie. I’ve been trying to do some research on this facility for myself, and you have a very extensive knowledge of this place! Your website is, by far, the best I’ve come across yet. You reference the fact that Brenda says the concrete doorway is called the “Gate to Hell.” Do you have any idea why they referenced that? Just wondering if that opening was of some significance. I can’t seem to find that area(or the cemetery) in any photographs(that I’ve seen…).Any info you might have would be great! I was there for 5 yrs. in the 50’s. Habitual runaway. I was determined to find my mom & siblings. They said, “You CAN’T run from here!” Did I fool them. I escaped 8 or 9 times:) Long story short, I could see the office bldg. from my then barred window. Forgot the name of the cottage. I worked in the laundry. Spent lots of time in the hole (as we called it) due to running. Only once I didn’t make it to Chgo. I jumped in the Des Plains river & started swimming. The guards finally caught me. They got in a boat. Couldn’t out swim that:( There was no pool then. I wouldn’t talk to any of the grown ups. I had withdrawn inside myself because of a very abusive childhood & being put in so many different homes. I left Geneva at 18 1/2 . When I was there babies were born at a hospital & not brought back with the mother. I DID find my family, and aunts, uncles, some cousins, & my grand parents. That my friends is what determination will do:) Been married to same good man over 50 years now. You see, he helped me learn how to feel, how to trust, & how to love. God protected me all those years, cause He had a husband picked out for me. For those of you who spent time there, I hope you have found peace, and Christ. Howe is my married name. Hi. I am looking for a piece of my history. A family member told me that my mother had me when she was 13 and while pregnant, was at this Geneva home for girls. I was born there. I am searching today for that truth because my mother won’t tell me about it. I will be 44 years old and she was there april of 1969. If anyone can help me gather some information on this place, I will be so happy. I am planning a visit to Geneva in the next few weeks to obtain my birth certificate and hopefully close this chapter of my life. I hope you find what you are looking for, Jeanne. I met up with Brenda (who writes on this site) in Geneva last August. The only thing left of the institution is the cemetery. You might want to visit there to get a sense of the place. There’s still a big concrete gateway next to the cemetery that Brenda tells me the girls called the ‘Gate to Hell’. The plaque in front of the cemetery talks about ‘wayward’ girls. They weren’t all wayward. From the ‘True Stories’ part of this site, you can read that some children just had no where else to go because parents died or they were locked up for running away from abuse. For others their biggest crime was truancy. In 1969 the institution still kept the girls locked up for most of the weekends and when they were not in school or working. This changed and the girls were given more freedom when I was there in the early 70’s. Your mom may have stayed in the dispensary rather than living on a cottage. The doctor that delivered you might have been Dr O’Dwyer. He was still alive a few years ago. The Geneva History Centre had a display about the institution and a woman buried in the cemetery, Sadie Cook. The Doctor attended that display. They may be able to help you but I’ve found they seem to be resistant to hear anything negative about Geneva’s history. Hi, I was in Geneva Girl School about this time, what was your mother’s name? the inmate’s babies at the local hospitals. I wish you luck during your visit to Geneva, the locals like to glorify the place and ignore the truth about the school. I was in Geneva, in the early 60’s. At that time, most of the girls had their babies at, Illinois Research Hospital, in Chicago. All of the pregnant girls were on Wallace Cottage. Jeanna, did you find out any more when you visited Geneva? Did you get your birth certificate? I was in Geneva in 1973-1974. I was on Hope Cottage until it was closed, then Fabian Cottage. That was when I worked there, Joan. Do you remember any of the kids or staff on Hope or Fabian? I hope your experience wasn’t too traumatic like so many of the stories I’ve heard from the other women that were there. Thank you for letting us know you’re out there. I remember a girl named Billie was on Hope Cottage. She and two other girls, from other cottages, were detained in Geneva until they were old enough to go to the women’s prison (Dwight?). I do not know which cottages they worked on, but I remember a Miss Phelps and a Mama Smith. I was at Geneva for 15 months and I took advantage of everything they offered to help better my life. I obtained my GED, completed the keypunch course and the junior lifeguard course, and was able to work off campus at the Jiffy factory. I was sent to Geneva because I was a habitual runaway – I had no criminal charges of any kind. Actually, I told the judge that I would probably continue to run if I was not sent to Geneva. It was one of the best decisions I ever made, as I straightened up and now have a good life. I have been successful in my career. I am married to a wonderful man who retired from the Dept. of Defense. After just a few months of retirement, he found that retirement was not for him, and he is now a member of law enforcement for the State of Colorado. I have two children and four grandchildren. There are two windows at the north end of the dispensary I spent most of my first trip to Geneva behind the second one. From that window I could see the gym and swimming pool. I remember any time a girl/girls left a cottage to go any where on campus such as school, church, dispensary, BP etc the matrons would call ahead announcing they were on their way and a return call was placed to the cottage when the girl/girls were coming back. During the day guards stood at their posts watching the girls walk to their destinations and at night the guards drove cars around campus shinning spot lights between cottages and on the windows. Looking at this picture today I can still see myself at twelve years old behind that fence so scared, alone and forgotten. i was on hope holly and wallace cottage. oh i learned how to knit and crosett, seramie, i like my craft teacher i cant remember her name . ms. savera, mr. tree, mr. mario nuzzo he was our keypunch teacher keypunch was my first job they treated us well we ate good got a lot of excerise i went to school got my 8th grade diploma we went on dances with the males i work off campus at vally view as a clerk i used to miss my mom but i kinda like it there since i had to be there i was there 11 months i exscape and wasreturned three days later ole geneve we never heard of the tale of abuse or death anyway that’s what i remember. Rose, you were there when I worked there! But I worked either on Oak or Wallace with the guys then. I was on Geneva Cottage as a cottage supervisor when I first started -can’t remember if it was late 1970 or early 1971. A few girls escaped on my shift. I was in the hall cutting some of the girls’ hair when it happened. Another supervisor was sitting in the office reading a book and a third one was asleep in the TV room! I’m the one that got in trouble!! If you want to write more about your time there, I’d love to create a page for you. It would be interesting to hear your memories and about your three days ‘on the run’! Thanks for commenting, Rose. Lovely to hear from you. I remember Ms Zimmerman Rose. She was a counselor and from what I knew of her, a really lovely woman. She married the superintendent. I remember Tree too but none of the others you mention. One of my favorite people there was Ma West. She was a real character and really loved the kids. She had integrity and was very fair. Thank you for visiting this site and for sharing your memories with us, Rose. #1 | Pinged by Wood Slab Furniture on May 6, 2017. See the best option for Reclaimed Wood Dining Table now in stock plus reasonably priced you can get now!